Seth Schenck hugs Cross Country and Track Coach John Tucker, who Schenck says had the biggest impact on his life during his high school career. NEW HAVEN, Mo. - During last Thursday’s Athletic Banquet a more than deserving Seth Schenck was named the St. Louis Post-Dispatch Scholar Athlete. “How impressive the list of Seth’s achievements may sound, his character is much more impressive”, said New Haven High School Principal Josh Hoener. 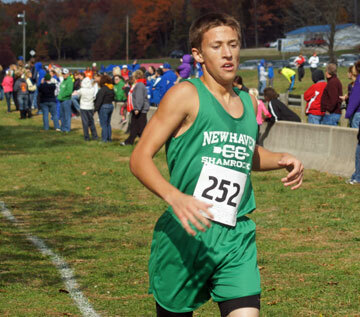 The list of athletic achievements Schenck has compiled throughout his four years at New Haven High School is quite impressive. The demanding amount of time and dedication it takes to achieve at such a high level athletically makes his academic achievements even more impressive. 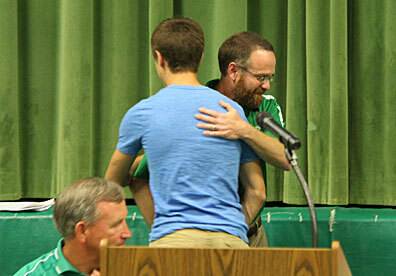 Seth ran cross country all four years, lettering each year at the varsity level. He was All-Conference all four years and the Four Rivers Conference (FRC) individual champion his senior year. Seth also played basketball all four years, lettering each of the past three years. 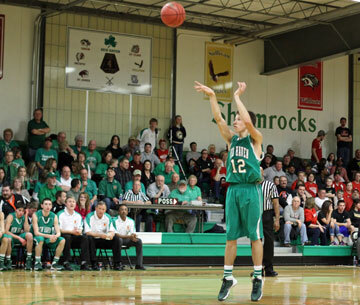 Schenck was voted second team All-Conference both his junior and senior years. Coach Ray Steinhoff shared a story from this past basketball season, which is a true testament to Seth’s character and sportsmanship. Coach Steinhoff also called Schenck’s work ethic “legendary”. Schenck joined the track team his junior year and has lettered both years. Seth was All - Conference and Individual Champion in both the 800 and 1600 meter events his junior year and then again his senior year in both of these events. Schenck was named the Four Rivers Conference Male Track Athlete of the year this year. Was a Class 1 State medalist in the 4x800 meter really his junior year. State Runner-up in the 1600 meter and State Champion in the 800 meter as a junior. Most recently Schenck was the Class 1 District Champion in both the 1600 meter and 800 meter runs and is currently ranked number one among Class 1 schools in the 800 meter. Seth is also a member of the 4x800 meter and 4x400 meter relay teams, which both finished first at districts this past weekend. All of Schenck’s athletic achievements, as impressive as they are, cannot top his accomplishments inside the classroom. Seth currently has a 4.26 GPA on a 4.0 scale and is ranked first in his class. When combining both his academic and athletic achievements, Schenck is arguably the greatest scholar athlete New Haven High School has ever seen. Seth will receive his award this evening (Tuesday) at Busch Stadium prior to the start of the Cardinals game.